Though I’m no big fan of John McCain, his choice of Alaska Gov. Sarah Palin as his running mate is a stroke of genius. Brilliant. I’m not into affirmative action picks, but Palin is smart, articulate, and competent in her own right, regardless of whether she has a uterus. And in this case, McCain picking a woman–a bright conservative who happens to be female–was necessary. It was necessary because Barack Obama made a big mistake in picking Joe Biden. He angered female Hillary supporters. Now, they will have a tough time voting for the Obama-Biden ticket, which dissed them, and the McCain affirmative action ticket, which gave them something to think about. 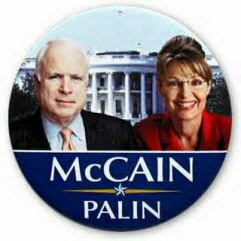 The choice of Palin makes me more enthused to cast my vote for John McCain in November, because I like Palin. She’s pro-drilling for oil in ANWR and offshore, she’s pro-life, and she’s an attractive and intelligent married mother of several kids. She articulates the conservative viewpoint well and is a skilled hunter and Second Amendment advocate. Excellent. I’m sure this will anger the NOW and feminist folks who dominate the Democratic Party. They don’t think that having a uterus and estrogen makes you a woman. In fact, looking at many of them, I think those are disqualifications. They only care whether you support abortion, gay marriage for lesbians, and other womYn (v. womAn) things. In contrast, Palin is feminine, without being feminist. And McCain’s timing was genius and masterful, too. The “bounce”–if there was any–and buzz about Barack Obama’s over-rated, ho-hum acceptance speech, last night, is over. Finito. So sad, too bad. The attacks on Palin are already beginning. We’ve seen and heard a lot from Cindy McCain’s Obama-supporting half-sister, this week. I wouldn’t be surprised if we begin hearing a lot from Palin’s ex-brother-in-law. Palin was briefly investigated, but cleared, regarding phone calls she made into the status of his position as an Alaska State Trooper on behalf of her sister. Believe me, when it comes to Palin, all of the feminists and Democrats’ talk about “breaking the glass ceiling” and “a woman in the White House” will be replaced by “Cats R Us.” They’ll be so-much cat-fight sniping against her by that crowd, we may run out of kitty litter. With the choice of Palin for the ticket, McCain’s chances of beating Barack Obama in November just got even better. Time for Michelle Hussein Obama to return that dress she bought from White House/Black Market. Wednesday Night, Republican strategist Mike Murphy told MSNBC that he believes Bill and Hillary Clinton will be voting for McCain, NOT Obama. You know–that privacy of the voting booth thing. She is qualified at running a large state and Obama, elected the same year 2006, hardly shows up for work. I want a tee-shirt that says: “Sarah Palin — change we can REALLY believe in.” I am happy with this choice that I’m giddy. She is not only ideal on most every issue, but it is a brilliant political move on a variety of levels. Just read your piece on Sarah. Great job! I love the fact that she eats what she kills. My kind of girl. My youngest daughter, whenever she sees a deer always says, O’ arent they cute…. My answer, as always, is yes they are, and boy do they taste good. For the record, I’ve had deer only once. At the time, there was only one kosher restaurant in the world that served kosher deer. Yum. Hope to see more. Drill around ’em and eat ’em. I haven’t felt this enthused since Ronald Reagan. There cheers for McCain for a wisdom that I didn’t know was there. Debbie, her inexperience in foreign affairs is not the issue here. She has a solid record of accomplishment as a mayor and governor and I don’t think she was picked just because she was a woman. Palin would be clearly an affirmative action pick if she was just picked for her gender. Its different from the Ferraro pick because she’s a homemaker, wife and mother. That’s what feminazi dogma frowns on. Palin is also the first major party pick from Alaska and it underlines America’s need to drill for oil there. She’s clearly head and shoulders above Obama in terms of executive experience. And she’s very popular in her home state. I’m still very uneasy about the Republican ticket, mainly because her positions on immigration and foreign policy are unknown, and we’ve seen what happens when unknowns such as Souter get on the Supreme Court. On the other hand, it is interesting that Geraldine Ferraro was quoted as saying that she has felt for years that she didn’t want to be the only woman who has run for national high office on a major party, and that she welcomes Palin’s company to that group. If she is an unofficial spokesperson for Hillary, which I believe she is, it increses the possibility that the Clintons don’t really want Obama to win. Sarah Palin is against illegal immigration. She is indeed a brilliant pick. I am ecstatic and now have a reason to vote for McCain. I think Obama fever is is subsiding. I have been talking up Gov. Palin for months. I am absolutely ecstatic with this pick. She’s staunchly conservative, she’s personable, young, pretty,and quirky in a good way (former Miss Alaska contestant, mooseburger eater, snowmobile rider, etc…). I think the media will love her in spite of themselves. I’m glad to see voters excited about Palin’s selection and I’m especially pleased to see that you are enthusiastic about it. I’ve been supporting Sen. McCain since Giuliani dropped out of the running. I hope you’re correct for all the reasons you say. My biggest problem with Palin is that she doesn’t bring many electoral votes with her. Also, Alaska doesn’t make the national news that much so it’s hard to relate to her daily issues. Senator McCain has adopted at least one child with severe medical problems. Governor Palin is a soccer mom with one child who has Down Syndrome. Hussein deals with a felon to buy property he cannot afford, hangs out with terrorists and spent the last 20 years with a spiritual mentor who preaches hatred. Is the choice any more obvious? Brilliant stroke indeed! A defender of good old America as it should be. Away with PC BS. Now I have to hold only ONE nostril when I pull the lever for McCain/Palin. It’s a good short term pick but it certainly removes the inexperience (especially on foreign policy)issue from McCain’s strategy. I have seen the press say this eliminates the ‘inexperience’ issue. Of course, inexperience is not the primary problem with Obama, it is his anti-American political beliefs. For that reason, Palin is certainly superior to Obama, since she is pro-American, rather than anti-American. On the other hand, her meteoric rise does seem somewhat similar to Obama’s. As far as I can see, when inexperienced or relatively inexperienced people from either party ascend into high office, they tend to rely on the foreign and domestic policy establishments of their party for guidance. True of Carter, Clinton, and ultimately Bush II. It was less true of Reagan, but he was a national political figure for 12-16 years prior to 1980, and an anti-communist for 30 years prior to 1980. Although I am uneasy about her, there is no question that she is superior to either Biden or Obama. Biden has a long history of supporting foreign policy positions that would damage our country. It shows the gullibility of the electorate that he has suddenly been transformed, like other Democratic appeasers like Aspin, Nunn & others, into a ‘strong foreign policy’ proponent. A good chocie by an Establishment RINO candidate. In fact I would have supported almost anyone except Huckabee, Pawlenty, Crist, Lindsey Graham. I was lucky to be listening on Mike Church this AM when news of VP candidate Palin came in. Hearing you and Mike say this was excellent was a great way to head in to hearing all the official announcement and her speech today on the radio. So far, the more I learn about her, the more I see that there is to like. She is a real woman–and perhaps she will awaken the country to inestimable power such a woman has to bring about good in the world. Sounds like an improvement on the pols and their families that I see these days, for sure. I don’t see any down side to this choice so far–this change (from Washington politics as usual) is refreshing. (I never thought I would find a positive thing to say or think about McCain–hmmm–maybe this is it–a good choice. Admittedly, despite loving to watch “Northern Exposure” I’d never heard of Gov. Palin until a few days ago. Today, I was somewhat unpleasantly shocked to see that she–not Romney–had been picked. Yes, she doesn’t have a ton of experience, but she’s running for VP while a man running for president, Barack Obama, doesn’t have much more. I mean, outside his time spent in the Illinois assembly (a state notorious for its corrupt politics), what has he done as U.S. senator besides promote his book “Audacity of Hope” and run for president? I’m really starting to like this. Lord willing, if things work out right, we’ll have our first female president. I am VERY enthused! I heard it this morning on Fox and was hopeful! I kept the tv on in my office until the announcement and honestly I was THRILLED! She was OUTSTANDING! Classy, intelligent, well-spoken, great points..from a lukewarm McCain supporter to a full fledged cheerleader in one fell swoop! GREAT pick! There is a post on Digger this morning that there is no record whatsoever regarding Ms. Palin’s position on immigration. If there is specific information out there, I am sure many people would be interested in knowing exactly what it is. Digger speculates that given McCain’s passion for amnesty, it is unlikely Palin would have strong objections to that position. Yeah! Everything will be better for me and my son (who is serving in the IDF) when James Baker is put in charge of the Jewish Problem. He’ll find a final solution to the Arab-Israeli conflict in no time! My countrymen, friends, family, and everyone I love will rest in peace knowing that McCain-Baker are in charge. one of my favorite bumper stickers of all time: “i love animals…they’re delicious!”. i think palin’s a brilliant move. if elected and does a good job, she’ll probably be ASKED to run for president in four years.